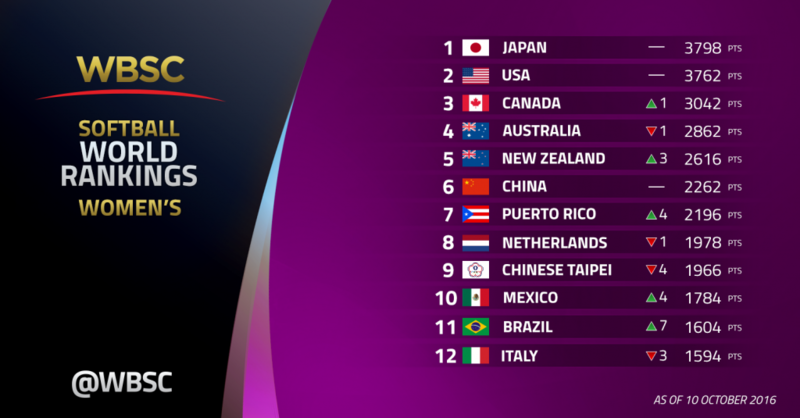 LAUSANNE, Switzerland — The World Baseball Softball Confederation today revealed the updated 2016 standings in the Official WBSC Women’s Softball World Rankings, following a reformatting of the rankings methodology to weigh additional events. Four continents (Asia, Europe, the Americas, and Oceania) are represented within the Top 10, while all five global continents are within the Top 25. Japan remains ranked No. 1 in the world, following a second-place finish at the 2016 Women’s Softball World Championship earlier this year in Surrey, Canada, which boosted the nation’s total ranking points to 3,798. Winning the gold medal at this year’s Women’s Softball World Championship was not enough for the USA to move up in the rankings, as the U.S. keeps its No. 2 world rank — just 36 points behind Japan. Canada has risen to a historical high at No. 3 in the world, with 3,042 points, continuing on their momentum of winning the bronze medal at the WBSC flagship Women’s Softball World Championship. Australia, slipped one position to No. 4, following a 10th place finish in Surrey. New Zealand rounds out the Top 5 with 2,616 points, improving three spots. China remains at No. 6 with 2,262 points. No. 7 Puerto Rico enters the Top 10 for the first time, but only 66 points behind China. Their bronze medal finish at the Jr. Women’s World Championship helped push them to their highest position to date. Netherlands remains the highest ranked European nation at the No. 8 post with 1,978 points. Trailing 12 points behind Netherlands, Chinese Taipei drops four spots to No. 9. Mexico elevates their position four spots to round out to the Top 10 with 1,784 points. Brazil has made the biggest jump, advancing seven spots to No. 11 in the world rankings (1,604 points). The top-ranked nation in Africa is No. 23 Botswana with 348 points. Sixteen nations are also making their first debut in the Softball World Rankings: Philippines, Austria, Greece, Guatemala, Peru, Ecuador, France, Korea, Uganda, Serbia, Ireland, Switzerland, Kenya, Singapore, India, and Israel. This follows a historic ten nations playing in their first women’s world championship this year in Surrey, Canada. The WBSC Softball World Rankings reflect a 4-year cycle with points generated from recent competitions including the WBSC Women’s Softball World Championship (max 1,150 points), and U-19 Women’s Softball World Championship (max 920 points). The qualifiers for the softball world championships, multi-sport and continental games and championships, and all WBSC sanctioned events involving Softball National Teams will now be granted world points beginning in 2017. The web-based version and methodology of the WBSC Softball World Rankings can be found at www.wbsc.org/rankings.